A Pakistani prisoner who was attacked by a fellow inmate at a high-security prison in Indian-administered Kashmir has died in hospital, doctors say. Sanaullah Ranjay, who was in a coma, died of multi-organ failure at a hospital in India's Chandigarh city early on Thursday. India said it would return his body to Pakistan. Islamabad called for an international probe into his death. Ranjay suffered injuries in the attack at Kot Bhalwal jail in Jammu last week. He was in prison for the past 17 years on militancy-related charges. 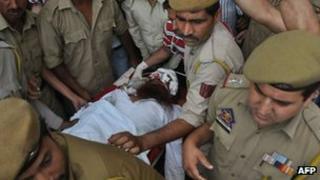 Ranjay was attacked by a former Indian army soldier convicted of murder after a row between the two men on 3 May, police said. The former soldier has been arrested and remanded to judicial custody. The attack on Ranjay happened on the day that an Indian prisoner, who died after being attacked in a Pakistani jail, was cremated in India. Dawn newspaper: Sanaullah, who was convicted by an Indian court for involvement in separatist activities in the disputed Kashmir region, was attacked in an Indian prison... in retaliation to a similar incident in a Pakistani jail where some prisoners attacked Sarabjit Singh, who was a death row inmate in Pakistan. Dunya TV: Innocent Sanaullah killed in response to terrorist Sarabjit's killing. Express News: What was innocent Sanaullah's crime? ARY News: Sanaullah crossed border by mistake. Sarabjit Singh, sentenced to death by Pakistan in 1991 for spying, had been attacked with bricks by inmates in Lahore's Kot Lakhpat jail a week earlier. "He had multiple organ failure due to severe head injury. The team of doctors headed by Prof YK Batra tried their best to revive him," the hospital said in a statement on Wednesday morning. Home Minister Sushil Kumar Shinde said Ranjay's body "will be handed over to Pakistan". The Chief Minister of Jammu and Kashmir state, Omar Abdullah, said an inquiry would be held in the attack on Ranjay. "While the inquiry will fix responsibility for any dereliction of duty, the fact that this happening at all is a matter of great regret," he wrote on the micro-blogging site, Twitter. But Pakistan said Ranjay's death was "extra-judicial killing" and called for an international investigation. "We are in a shock and deep grief over this barbaric act," AFP quoted the Pakistani high commission spokesman Manzoor Ali Memon as saying. "This is an extra-judicial killing of an innocent citizen of Pakistan right under the noses of the Indian jail authorities. "We have demanded an inquiry of international level to find out the culprits and expose the connivance," he said. On Tuesday, two members of Ranjay's family - brother-in-law Mohammed Sehzaad and nephew Mohammed Asif - visited him in hospital in India. On Wednesday, India's Supreme Court said it was "pained and concerned" at the attack on Ranjay and wondered why adequate steps were not being taken to protect prisoners. "We are more concerned why such incidents are happening in jails. Lives of inmates are put in danger. It is a serious matter and can't be accepted," the court said. A foreign ministry spokesman said an "advisory had been issued to strengthen security for Pakistani prisoners in Indian jails". There were 535 Indian prisoners, including 483 fishermen, in Pakistani jails and 272 Pakistani prisoners in Indian jails, the spokesman said.